Today 7 Kids College Fund is having a non-hopping blog hop for you to show off the new images from Sugar Pea Designs. They are so adorable and will send cheer to anyone! If you do not have the time to visit each blog just go directly to the 7 Kids Store Blog and leave your comment, WHY? COMMENT TO WIN A $25 GIFT CERTIFICATE! All you need to do to win the non-hopping hop prize of a $25 gift certificate to the store is to comment this post. The winner will be announced on the blog this Thursday!!! I colored the image in Copics and used Xpress It blending paper. Then I used 2 doilies and then added the LaLa Land scalloped banner to the bottom of the window. The pretty little flowers are a gift from a very sweet blogger friend and they look great on the card. I used the banner die from Magnolia to stamp my sentiment from the Sugar Pea set on and then edged it with ink. The butterflies I cut out from my KaiserKraft paper pad. I hope you enjoy the non-hopping blog hop today and the next in line is Rosemary!! Well now my dear Kelly... this is just plain old cute, cute, cute! Those pretty pink shutters and the multi coloured topper look so good on here. 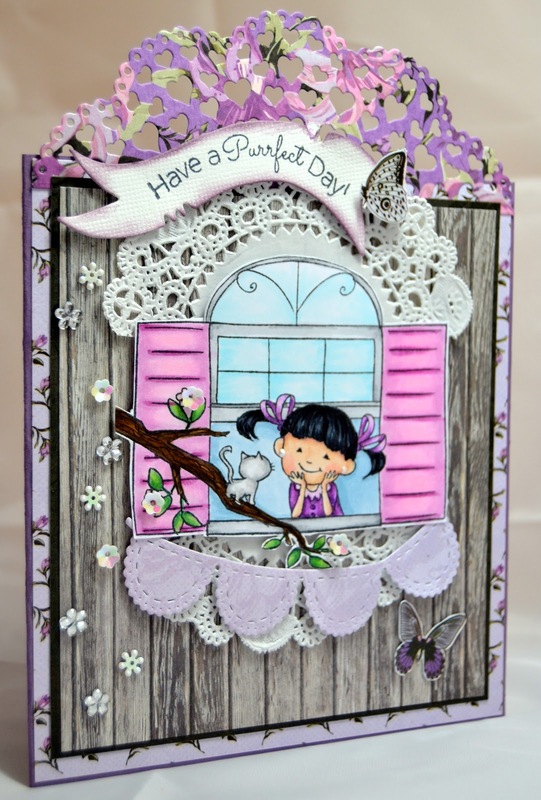 Love the sweet little gal and her cat image too! You have designed this card so beautifully!!!!! Every thing is perfect together. So cute and happy - Love it Sugar!! absolutely adorable!!! love the image, the coloring is stunning (as always) and the sentiment is just purrrfect!!! Too cute! 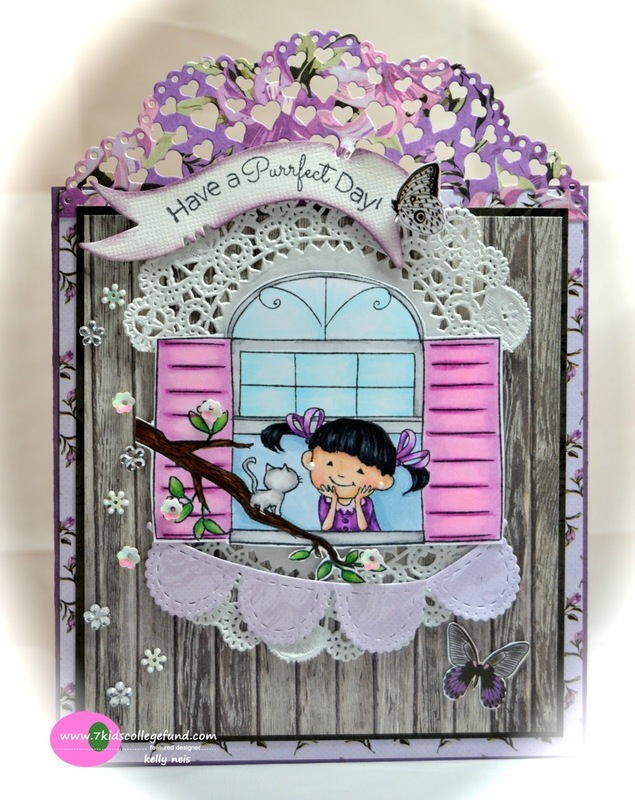 What a brilliant way to use that doily die cut - gorgeous!